Anyone who has ever seen the printing by letterpress in practise will understand the fascination of the process which is so dependent upon the skill of the printer. Equally anyone who has witnessed printing dampened home-made paper with a press such has the Albion will marvel at the quality which can be obtained – with a crispness and intensity of black which is almost never possible with more modern forms of printing. 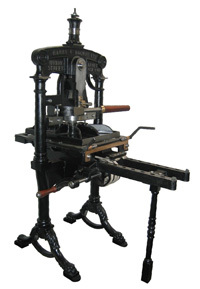 Letterpress, the original printing process, as invented by Gutenberg; is no longer used by most commercial printers (who mainly use some form of digital printing). However letterpress continues to be used by a number of specialist printers who delight in the production of prestigious handmade limited editions, using traditional methods combined with fine bindings. In the USA, however, letterpress printed wedding and social invitations etc are very fashionable. In the UK there are large numbers of amateur printers, often using the ubiquitous Adana small printing presses, who print as a hobby; and a very satisfying hobby it can be. New presses for letterpress printing are currently manufactured in the UK (by Harry F. Rochat - Albion, as illustrated on the left). Reconditioned Adana 8x5 Presses (illustrated on the left) and its parts are available from the firm of Caslon. The Adana is an excellent machine for the beginner; although its size limits the size of paper which can be printed, with experience excellent results can be obtained for most jobs. A fascinating description of a home-made wooden press has been published in Small Printing, click Wooden Press. Some printers who wish to use larger sheets of paper have graduated to the purchase of a larger press such as the 'Arab' (for printing large numbers of copies) or the desktop 'Albion' Press (the latter is much sought after and is now very expensive). 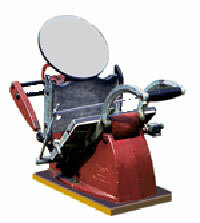 Although many of these presses are over a hundred years old, they are very sturdy and usually very reliable. It should be remembered that Printing Presses like, most machines, should be regularly cleaned and lubricated. A very comprehensive range of materials and accessories needed for letterpress printing are advertised in the Small Printer Magazine, published by BPS. Lead Type is still being cast and second hand type is widely available, type also features strongly in the sales and auctions associated with the BPS annual conventions. It is recommended that second- hand types from different sources are not mixed. Some amateur printers make a hobby of collecting as wide a range as possible of different type faces, often in small quantities which are useful only for only for the smallist job. For serious letterpress printing it is best to concentrate on a limited range of faces but of good quality and quantity. For large scale printing, lead type can be cast for the particular job in question using a Linotype or Monotype machine. In summary, type is selected and placed onto a composing stick (this gets quicker with practice after you get experience in reading type which is ‘upside down and the wrong way round’). The type is transferred to a chase and the image is finished by using spaces and lead rules. The block of type is set firmly inside the chase, using wooden ‘furniture’ and expanding mechanical quoins; the result is known as the 'forme'. The chase is set inside the ‘type bed’ inside the printing press, following instructions applicable to the press being used. A small quantity of ink is applied to the ink disc and the apparatus for holding paper is adjusted according to the instructions for the press. A first impression, ‘pull’, is made to allow final checks of the wording/spacing and allowing adjustments to the press to ensure satisfactory quality of the printing before the print run is made. A detailed description of the printing process as applicable to hand platens such as the Adana 8x5 or Model No. 3 is given in a paper from the 'BPS Introduction to Printing' which may be accessed by clicking Hand Platens. 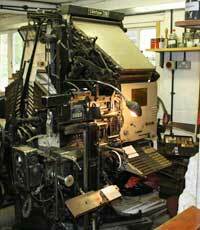 In July 2010 the BPS Dorset Branch held a session on printing with the Adana 8x5 . A short report containing some useful practical tips may be accessed by clicking Adana Printing - Dorset Branch . Why don’t I get a good result? Disappointing results can be the result of many things and sometimes you have to be a detective to discover the cause of the problem. Over-inking of one side or corner of the impression, perhaps with under inking of other sides or corners can usually be adjusted easily; here there are two schools of action – some printers are happy to use the adjusting screws for the type bed, others prefer to use padding behind the chase to get the required effect. Sometimes you get a poor impression only in certain letters, we should remember that type when cast always is never exactly the same for each moulding – there is an allowed permissible range of type heights. With wear, the height of a letter gets smaller over time. These small but significant factors can be mitigated by using paper padding behind the chase. Also do not forget that your press might have had over a hundred years of heavy use - wear is almost certain (usually around the centre of the type bed). The process of overcoming these problems is known as 'makeready'. A detailed description of the makeready process is given in a paper by Denis Logan which may be accessed by clicking Makeready. John Easson's History of Printing is presented on the Web Page on the 'History of Printing'. Because letterpress printing played such key roles in the History of Printing, many practical aspects of Letterpress are described by John Easson are still highly relevant; accordingly people who are interested in practical aspects of letterpress should examine the range of topics discussed. This is a short, but wonderful film on YouTube from USA, where letterpress is still very popular; click on letterpress. Also for a bit of fun see the Wayzgoose where poster printing is done with a steamroller; click on steamroller . Again on YouTube is a fascinating series of unique short films showing Stan Nelson casting type by hand, this can be accessed by clicking casting type .